This month’s edition of Men’s Health, the glossy magazine that typically depicts muscular, if not downright freakish, male models on its cover, included five short profiles of middle-age guys who have been diagnosed with Alzheimer’s or a very similar disease. One is Mike Belleville, whom I’ve known for the better part of two years through the Alzheimer’s Association, and now serves as an advisor to the national Alzheimer’s board on the early-onset version of the disease. Another is Greg O’Brien, a resident of Cape Cod who wrote the indispensable account of his disease in the book On Pluto: Inside the Mind of Alzheimer’s. In the interview with Men’s Health, O’Brien described Alzheimer’s as a frequent “fog creeping up on the horizon, where you feel it on the back of your neck and it rises and envelopes your head. The brain just feels numb.” One of the things that makes On Pluto such an illuminating read is that, at a time when his mother was becoming seriously demented, O’Brien himself suffered a head injury in a bike accident that seems to have accelerated his own case of the disease. “Doctors said these [head injuries] unmasked a disease,” O’Brien told Men’s Health. “They won’t cause dementia, but if you’re predisposed to it, it can bring it on.” The magazine article also noted that O’Brien has regular hallucinations, including visions of his mother, who died in 2008. Several of the men had to leave a job or a craft they loved or enjoyed. Anthony Ayers, a well-known furniture designer, was diagnosed at 56. Initially, Ayers suspected that he’d had a stroke. As the author of the magazine article, Cindy Kuzma, explained, “One day his right leg just wouldn’t move the way he wanted it to move.” But doctors found no evidence of a stroke. In the next few years, Ayers had symptoms that were “annoying,” not debilitating. But during a trip to Italy, he had trouble understanding the historical documents he was reading. And his wife began to notice that he was forgetting things. His doctor thought he had an attention-deficit disorder, but the medication just made things worse. There was no obvious culprit in his family tree that might have carried the APOE4 gene, which makes certain individuals more likely to develop the disease. “Once an avid reader and writer, he now struggles to print his own name,” Kuzma noted. These days he has trouble using a tape measure, “so the woodworking he once loved has become nearly impossible.” The cabinet he is working on is likely his last, according to Kuzma. If there is any sign of a silver lining, it resides in his ability to paint, at least for now. Like most people when they detect the first symptoms of Alzheimer’s, Brian Kursonis, a financial analyst, was not ready to grasp the symptoms’ significance. “I think I hid my Alzheimer’s from me,” Kursonis said. “I wasn’t relying on my brain, I was relying on calendars and reminders.” By early 2015, according to Kuzma, Kursonis was developing symptoms “no time management system could mask.” At least once a day, he would “blank out.” Not surprisingly, his production at work slackened. His wife would sometimes find her husband’s morning coffee still in the microwave hours later. Perhaps the most poignant story belongs to Michael Ellenbogan, who experienced symptoms of dementia when he was only 39—exceedingly early for Alzheimer’s. “He’d pick up the phone to dial a four-digit extension and stop because he couldn’t remember it,” according to Kuzma. In the middle of conversations with his employees, he would forget their names. “To see myself deteriorate like this to the point I now need so much help in so many ways…it’s so frustrating.” But Ellenbogan has gone on to become an inspirational speaker, often before large crowds. Belleville, my cohort at the Alzheimer’s Association, at first “laughed off” his minor memory lapses as signs of stress—my experience exactly. “Eventually,” Kuzma commented, “Belleville’s struggles became more noticeable.” The telecom technician had to ask his co-workers how to do his own job. A turning point in his family life came when his wife had to fill him in on the “terrible argument” they had the previous night. Mike had no recollection of it. Such are the insidious ways of Alzheimer’s. I am not alone in the dementia blogsphere. I’ve discovered an entire solar system of blogs, all of which are written by people with Alzheimer’s or some other form of dementia. How did I learn of this discovery? Since January 2016 I have been serving on a board whose function is to allocate grants designed to help alleviate the suffering of people in the late stages of Alzheimer’s. A colleague of mine on that board who is familiar with my blog alerted me of the Dementia Action Network [daanow.org] and by the time I checked out the site myself, my blog had been added to the list. The bloggers are a diverse group. Six live in the United States or Canada, and four are in Australia, along with one person in England. Two of the bloggers write about Lewy Body disease, a cousin of early-onset Alzheimer’s disease. Ken Clasper’s blog has a very specific focus. The title is Living well with Mild Cognitive, Bronchiectasis and Osteoarthritis. “Many of us remember being enthralled as kids by the future of robots,” Clasper writes. “But how many of us actually ever thought we’d ever end up with a robotic helper of our 0wn?” Clasper goes on to discuss how technology could help alleviate the shortage of nurses skilled at caring for people in the disease’s later stages. Wendy Mitchell, who lives in England, writes the blog “Which me am I today?” Her most recent post focuses on a familiar topic among people in the early stage of the disease—the weakening of short-term memory. “I started this blog to allow me, in the first instance, to write all my thoughts, before they’re lost. Luckily, the part of my brain that allows me to type hasn’t broken and I find that easier than talking. I have calendars that take care of the future but this blog serves as a reminder of what I’ve done and said in the past—it now serves as my memory.” Mitchell’s blog is also visually pleasing. When people visit the blog, they see a gorgeous photo—perhaps the Lake District, where William Wordsworth composed his “Daffodils” poem in 1804? Something else struck me about Mitchell’s blog: She has four public service ads on her site, all related to Alzheimer’s. Urban continued, “So many of my friends living across the country, whom I love very dearly, are standing on the edge of a very high cliff, looking at the murky ground below and wondering. Your first instinct is to grab them and pull them back, but most times they will return looking for answers. “I think the better approach is to talk to them and help them understand that they do not belong standing there in the first place, wondering. They believe that no one cares or would miss them, but we do, we just do a poor job of letting them know. Sage words from a man who appears to have wrestled with Alzheimer’s far longer than most of us. go to the website daanow.org/resource-center/resources/#books and scroll down to “Blogs Written by People Living With Dementia.” My apology on behalf of my blogging software for not being able, at this point, to embed live links in my posts. If anyone can provide advice, I will be grateful. You can reach me at mitch.evich@gmail.com. For those of us who live in large metropolitan areas or smaller industrial cities, will the Trump administration be harmful to our health? The new president, it appears, intends to gut environmental regulations, including the Clean Air Act of 1990. In Los Angeles, long known for its dubious air quality, things may get a good deal worse. In a January 31 Los Angeles Times article, Melissa Healy reported on a correlation between extensive exposure to smog and dementia, particularly among older women. For this demographic, Healy noted, “breathing air that is heavily polluted by vehicle exhaust and other sources of fine particulates nearly doubles the likelihood of developing dementia.” And for women who carry the APOE4 gene, which makes it more likely to develop Alzheimer’s, the combination of genetics and environment can be toxic, hastening the disease’s progress. Unlike diseases such as asthma, where the role of poor air quality is well understood, much still needs to be learned how air pollution can lead to Alzheimer’s or other forms of dementia. The study that Healy drew on appeared in the journal Translational Psychiatry. She noted that three biomedical research methods were deployed, and all revealed high levels of “very fine air particles” caused by cars and other vehicles. Smog isn’t the only culprit. Proximity to power plants also can be a factor, as can frequent exposure to the burning of wood. As Healy noted, studies involving laboratory mice breathing polluted air in ten freeway locations in Los Angeles led to clumps of amyloid plaque, the protein deposits in the brain that are a common feature of Alzheimer’s. A study published in 2011 in the British medical journal The Lancet found that people living near congested highways were at far greater risk of having a stroke or developing Alzheimer’s than people who didn’t. Could the people who live in the shadow of a busy highway do so because they can’t afford to live elsewhere? As Healy reported, the noted Alzheimer’s researcher Dr. Samuel Gandy at Mt. Sinai Hospital in New York was the first to determine that air pollution could lead to “cell death, inflammation and the build-up of amyloid protein” in the brains of mice. This is not the first time that a presidential administration has been indifferent, even hostile, to science. Ronald Reagan, I submit, initiated the trend. The Gipper deserves credit for his role, opposite Soviet Premier Mikhail Gorbachev, in bringing the decades-long Cold War to a peaceful conclusion. But each of his Republican successors, with the exception of the honorable George H.W. Bush, has seemed not only uninterested in science but hostile to it. Global warming a hoax? How so? Who could stage such a “hoax”? Who would benefit from it? Some international cabal? The Democratic Party? I don’t think so. As a friend of mine commented during the disputed 2000 election, “The Democrats can’t even steal an election!” As far as I can tell, staging global warming is way beyond the Democrats’ portfolio. What the Trump administration is really attacking is the values of the Enlightenment, the era that began in the seventeenth century and, in America, reached full flower in Thomas Jefferson’s Declaration of Independence in 1776. Unlike in earlier centuries, in other nations, there was no magical thinking in the founding of the United States. “Alternative facts,” as Trump’s spokewoman Kellyanne Conway suggested, are not facts. Their correct names are “lies.” If you don’t believe me, consult the works of George Orwell. Start with his essay “Politics and the English language,” and, if you can stomach it, take on his bleak dystopian novel 1984. It’s hard not to feel that the president of the United States is living in an alternative universe, in which facts are fungible, if not just made up out of full cloth. 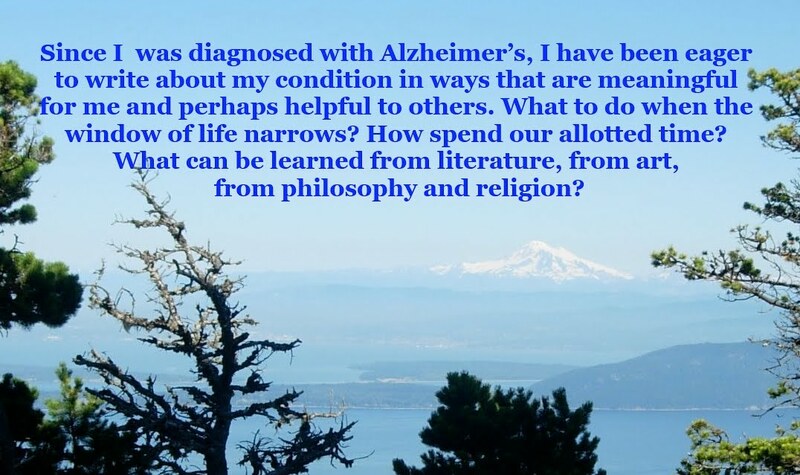 Anyone with Alzheimer’s who still has his or her wits intact is likely to have forebodings about the disease, no matter how many years the passenger has to sail to arrive in that dark, forbidding port. The final journey, technically the late stage of Alzheimer’s, can go on for many years. The final stage, as I understand it, can go on for many years with what I might call the soul, or if you prefer, the psyche, still intact. But what to do when the person with Alzheimer’s is just a shadow of his or her vital past? In the book Before I Forget: Love, Hope, Help, and Acceptance in Our Fight Against Alzheimer’s, the authors, including the celebrity maven B. Smith, who has the disease, make the point that the late stage of the disease is not all confusion and misery. There are still pleasurable moments, as I understand it, in the joy of being with loved ones and looking through treasured photo albums, among other social activities. Recently, one of Massachusetts’ oldest institutions—the Massachusetts Medical Society, founded soon after the decisive American Revolution battle of Yorktown in 1781—was in the news for its provocative position on right-to-die legislation. As Patricia Wren, the Boston Globe reporter who wrote the article, noted that back in 2012 the medical society opposed the referendum. The reversal, Wren commented, came at a time when “death with dignity” is gaining traction, driven by some medical organizations. Will that privilege extend to Alzheimer’s patients in their terminal stage? Until recently, I assumed that the answer was no. Last year I learned that even Oregon’s pioneering right-to-die legislation does not permit doctor-assisted suicide if the person is deemed incompetent on account of Alzheimer’s or some other form of dementia. But then I came across the website of End of Life Washington [endoflifewa.org], a Seattle-based organization that appears to be able to provide a route out of a Catch-22 for people who want to die with dignity without devastating their loved ones’ financial and emotional resources. A two-page, single-spaced statement offers up a wealth of questions as well as answers. “How can I maintain dignity or ensure control over my dying after I become incompetent? How can I or someone else end my life if I become completely demented? If you are the caregiver, in many cases one’s spouse, how do you go about making the grave decision to stop providing life-sustaining nutrition?” The statement goes on to note that while many people would prefer to die naturally than be kept alive in the very late stage of Alzheimer’s, these wishes are not always honored. End of Life Washington’s role is to make sure that the person with dementia makes clear his or her intention before she or he is no longer competent to make such a decision. As an example, the organization describes an anonymous person, under the alias “Mary,” as someone whose parents both had Alzheimer’s, leading to Mary’s eventually developing the disease as well. End of Life Washington decribed Mary as a strong-willed woman, who cared for each of her parents as they succumbed. “After acquiring a pledge from her physician to refer her to hospice as soon as she was deemed eligible, she voluntarily stopped eating and drinking,” leading, over time, to her death, in accordance with her wishes. This approach, of course, remains controversial. It’s not only the Catholic Church that has qualms about what might be deemed as euthanasia. Many doctors have concerns as well. There is good reason why the Hippocratic oath—Do no harm—has endured for roughly 2400 years. But I like the idea of being spared the torment of the disease’s terminal ravages. And I suspect that most of my Alzheimer’s disease cohorts would prefer that final option as well.